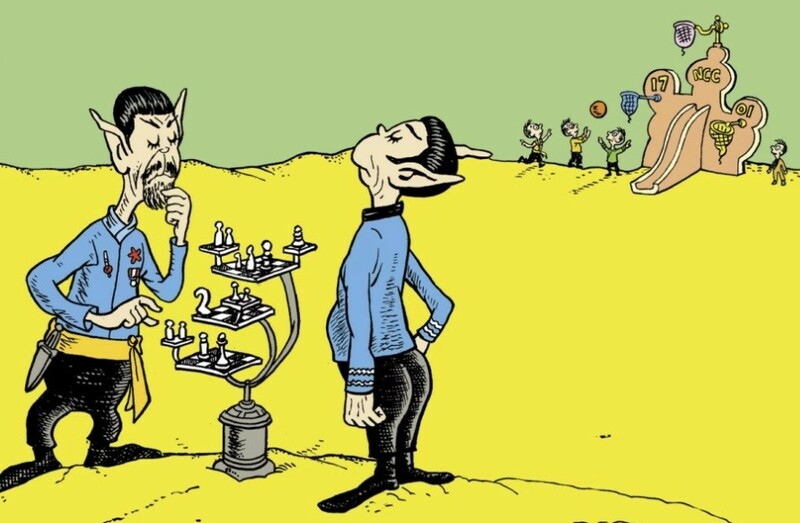 As Mr. Spock would say…this appears to be logical. So this case, with extensive copying, should be a slam dunk, right? You’d be mistaken about that. Quite surprisingly, the Judge here basically ignores Cat NOT in the Hat. The Court makes a primary citation to the Cat NOT in the Hat case only once in the entire opinion. Further, this mention is for the unremarkable proposition that the Court can resolve fair use issues on a Motion to Dismiss. 8 Interestingly, the Plaintiffs opposed hearing the fair use claim on the Motion to Dismiss, objecting that proof of “market harm” under factor four will require discovery. 9 We will return to this point later. The Judge leads off by concluding that, despite the protestations of the Defendants, Oh, The Places You’ll Boldly Go!, to the contrary, OTPYBG is not a parody. The illustration style is clearly that of Dr. Seuss, right down to the lack of straight lines as evidenced by the droopy baskets in the background. But the characters in the foreground are clearly Vulcans and the NCC 1701 is a reference to the Enterprise. As to the third factor, the “amount and substantiality of the portion used,” the Court once again is unable to escape the transformative quagmire. Which is exactly the reason why the Plaintiffs objected to hearing the fair use claim on a Motion to Dismiss! Nevertheless, this works out for Dr. Seuss, since the Judge must at this stage assume all the facts pled by the Plaintiff are true, the allegations of the complaint regarding negative market effect tip factor four in favor of the Plaintiff. The use by the Court of the word “currently” leads me to believe that the Court will reconsider the question of fair use somewhere down the line. So, the copyright portion of the case will proceed, but remember, since fair use is an affirmative defense, the Defendants will bear the burden of proof. But the Court considers this a close case. See? The word “transformed” is right there in the definition of what a derivative work is. The right to “transform” the work is my exclusive right as a copyright holder. You do not have the right to “transform” my work without my permission. It’s right there in the plain text of the Copyright Act. Yet, the Defendants trumpeted this ruling against them on their website as a victory! 24 “Vindication” screams the headline. Later this was amended to note that only the trademark portions got dismissed, not the copyright claims, which of course, go forward. So guys, right now, the only place you’re going to “boldly go” is back to the courthouse.